I’ve been loving this color palette for awhile now and think it would be so perfect for a rustic setting with a touch of glam. I just love mixing styles that don’t normally go together. What do you think? That dress! I searched and searched the J. Crew website, and I cannot find it! I love it to pieces. OMGGGGZZZzzzZzzeeee!!! I, too heart the loafer and belt-clad lady. 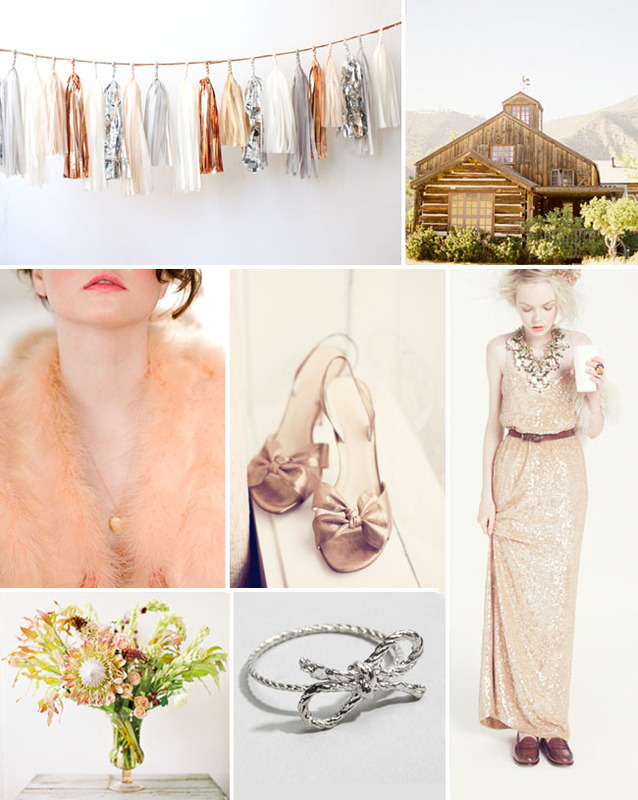 Yesterday’s post’s venue would be the ideal place for a wedding with this palette. Ecochic + Lindsay- It looks like J Crew is no longer selling that dress which is a bummer since I LOVE it. :( I did find a few similar dresses that paired with a leather belt would look very close. Hope this helps! This color palette is so chic! Love, Love. Where are the shoes from?! what a lovely combination! i absolutely adore the knot ring!! OH Joey and Jessica are our photographers for this April! So excited! That sparkly necklace is amazing!